In this four-day workshop eclipsed by the solstice, Janet’s skillful sequencing and use of props will help you reach new levels of awareness in your practice. Guest teacher Patricia Layton will lead Sutra chanting. Special evening sessions will include singing bowls and Thai walking massage. 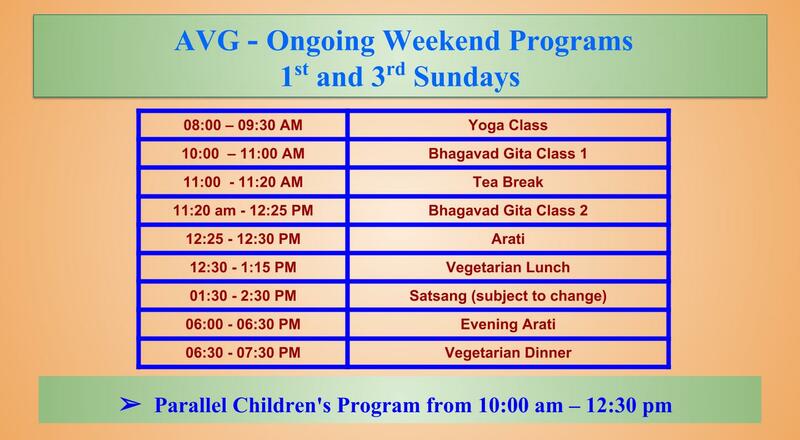 At least 6 months of previous, consistent yoga asana practice are required to attend this courses. Please Click on Registration Form to Register. Abhishekam to Lord Daksinamurti, Puja & Arati. Swami Viditatmanandaji's Gurupūrṇimā day Talk during Alankara to the Lord Daksinamurti. 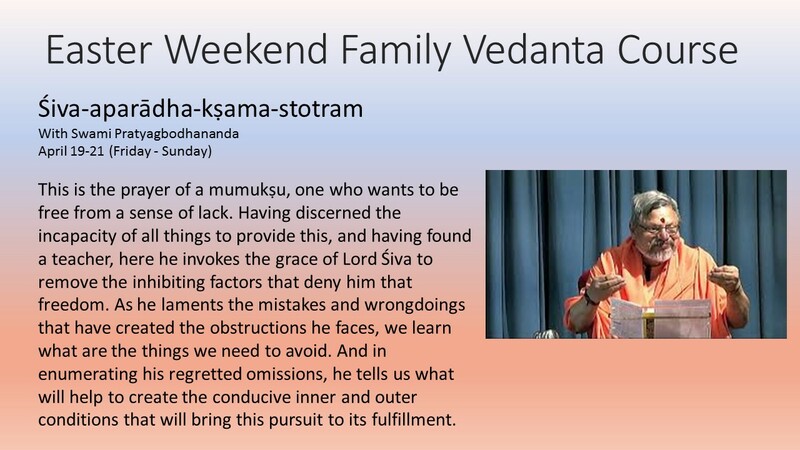 Topic: Vivekacūḍāmaṇi 254 onward with Swami Viditatmananda Meaningfully called the 'Crest Jewel of Discrimination,' the text addresses the seeker desirous of the ultimate freedom, mokṣa. It refers to the inability to discriminate between the timeless and time-bound as the delusion caused by avidyā, ignorance, which keeps one bound to samsāra, the cycle of birth and death and a life of becoming. Swamiji will unfold the nature of avidyā and show how to overcome it. A series of 3 Saturday morning classes with Diana from 10 am to 12:30 pm beginning on Oct 12 and ending on Oct 26. A series of 3 Saturday morning classes with Diana from 10 am to 12:30 pm beginning on Nov 9 and ending on Nov 23. 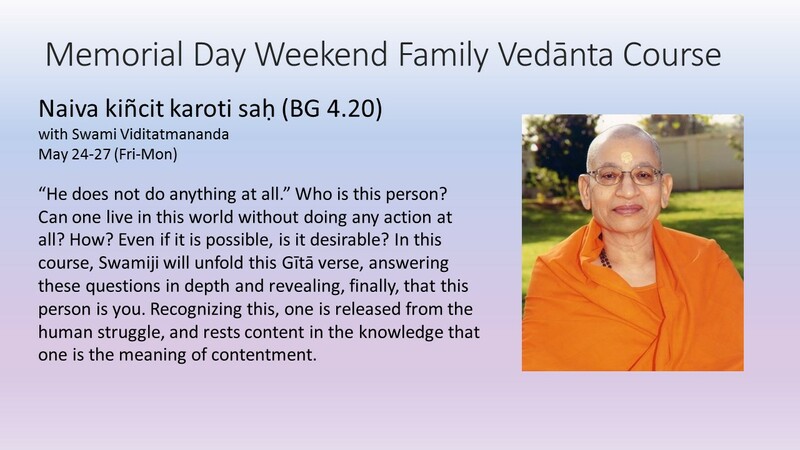 Topic : Vedanta and Meditation Meditation plays an integral part in a seeker's quest for truth. To receive the knowledge of Vedānta, one requires reverential equanimity in all situations, mastery over the ways of one's mind, and grace. The first is achieved by karma-yoga. The other two are gained by meditation, defined in the śāstra as a mental activity with īśvara as its topic. Swamiji will offer detailed in-depth guidance on meditation that is consistent with the vision of Vedānta. A series of 3 Saturday morning classes with Diana from 10 am to 12:30 pm beginning on Dec 7 and ending on Dec 21. Topic: Sundara-kāṇḍa of Vālmīki Rāmāyaṇa Swami Tattvavidananda will continue his annual exposition of part of the Sundara-kāṇḍa of the Rāmāyaṇa. A rich source of Vaidika culture and wisdom, this work informs the thinking and attitudes of every Hindu who has been adequately exposed to it. 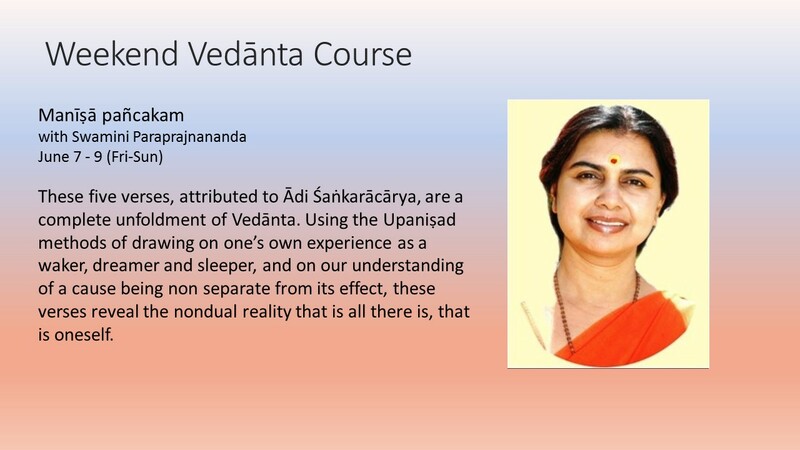 A separate series of classes on a Vedānta topic (to be announced) may also be included in this year-end program. Abhishekam to Lord Daksinamurti, Swamiji's New Years day message, Puja, Arati and Lunch.